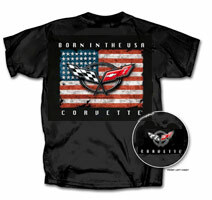 Highly detailed large artwork of the American Flag complemented b y the Chevrolet C5 Corvette Badge Emblem in the foreground, as shown above on the back of the Tee. Highly Detailed smaller artwork detail of the C5 Chevrolet Corvette badge emblem and the CORVETTE script in white on the front left of chest, in accurate factory detail and colour. The main artwork of the American Flag appears in a ’rustic’ fashion as the flag’s edges appears torn. The C5 Corvette Badge emblem of the crossed racing flags is detailed in a high gloss appearance, almost in three dimensional effects, with true correct factory detail and colours. The upper and lower script of ‘Born in the USA’ is in Bold White font, with the lower script ‘CORVETTE’ in same script colour and style. Tee shirt Colour: Available in Black and White, with genuine GM Official Licensed Product Tag.